Lethwei is an ancient martial art developed in Burma. 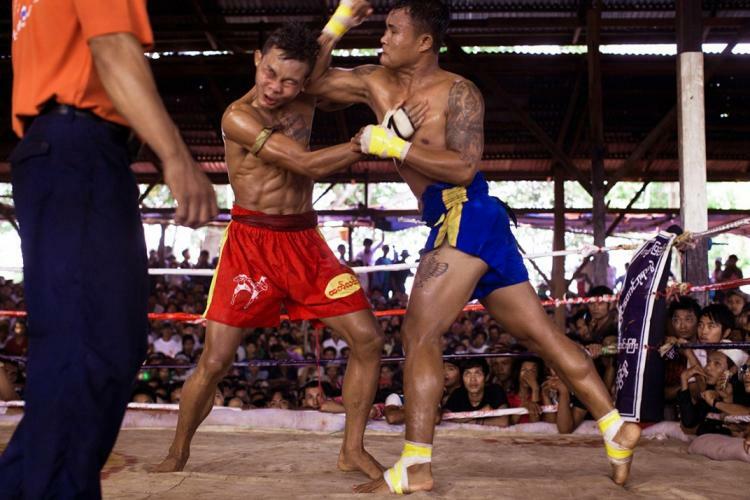 In recent years, it is commonly referred to as traditional Myanmar boxing as well. This particular combat sport is known for its violent style and primitive rules. 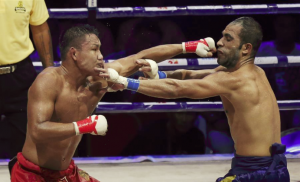 An overview of Lethwei’s characteristics and how it stands out from other martial arts is detailed in the sections below. Lethwei masters and historians have dated the origin of this martial arts as far back as 1000 years ago (during the Pyu kingdom). They stated that the Lethwei system of fighting was needed by the Burmese to defend themselves from other warring nations. When the Burmese civilians were not busy defending themselves, Lethwei matches were held during holidays, festivals and even at funerals. Therefore, fighting is a common theme for village entertainment and important part of personal pride. An important part of Lethwei is the pre-fight rituals consisting of gestures and a dance performed by each fighter. The Lekkha Moun is a gesture that is performed before the fight. During a Lethwei match, a fighter may also approach his opponent and perform the Lekkha Moun to taunt their opponent to be more aggressive. This gesture is shown in the image on the left where the fighter’s raised hand will slap his other arm multiple times. The second component of the pre-fight ritual is the Lethwei Yay dance. A snapshot of a fighter performing this dance is exhibited on the right. This dance is performed before the fights, usually in combinations with the Lekkha Moun and then performed again by the victorious fighter after the match. A demonstration of the Lekkha Moun and Lethwei Yay movements are performed from a famous Canadian Lethwei fighter in the video below. To grow the combat sport of Lethwei globally, the organizers of Lethwei events began adopting specific components from other international combat sports. For example, competitors went from battling in sandpits to fighting in boxing rings. New rules were implemented in the changes as well. In an attempt to not lose its uniqueness and traditions, the combat sport of Lethwei is able to retain critical elements like their equipment, fighting techniques and special rules. Lethwei is known as Burmese bare knuckle fighting for a reason. Keeping to its traditional roots, the fighters do not wear boxing gloves or even MMA gloves. They only wear the gauze and tape that are normally worn under those gloves. An example of two Lethwei fighters with their fist wrapped according to the set standard is shown below. Looking closely at the hands of both fighters, their hands are only protected with gauze wrap and tape. The martial arts of Lethwei has a wide array of standup techniques. Its striking techniques consist of punches, kicks, elbows and last but not least headbutts. Headbutt strikes are rarely incorporated in most martial arts techniques and is one of the main component that makes Lethwei distinctively standout from the rest. Lethwei fighters can be seen launching forward with their forehead aiming directly at their opponent’s face. Lethwei martial artists also learn to mix headbutts with their striking combinations. These headbutts can cause devastating effects as well as knockout the opponent. The following video clip shows a fighter effectively using it in a competition. The combination of the striking techniques used in Lethwei and the absence of padding on the fighter’s hands means that Lethwei combatants have a higher chance of breaking their hands and getting facial cuts during their match. Many fighters will deliver strikes that are intended to create deep cuts and large gashes with the hope of the match ending due to the severity of the opponent’s injury. Originally, Lethwei did not have judges, a point system or even rounds. The combatants fought until only one of them was still standing. In an attempt to modernize the sport, professional matches consist of five 3-minute rounds with 2 minute rests in between. However, Lethwei has kept its traditional roots of not using a scoring system. To win a match, a fighter has to knockout their opponent passed the point of recovery or their opponent has to withdraw due to injuries. Otherwise, the match is declared a draw. Therefore, the number of draws on the record of Lethwei fighters is substantially higher than other striking combat sports. This draw rule also promotes aggression and helps make Lethwei a pleasing sight for blood thirsty fans that love the violence. To further push the aggressive nature of Lethwei, warnings can be given to defensive and cautious fighters. Referees can even end fights early due to lack of aggression and engagement between both fighters, which is a humiliating result desired by no fighter. One crazy thing about the Lethwei fight rules is the ability to call an injury timeout. Before the final round of a match, a coach can call an injury timeout if their fighter has been knocked down and look like they will not make it to the 8-count. The coach and fellow cornerman will then work on reviving their fighter back to consciousness and ready to continue fighting again. This injury timeout rule makes Lethwei dangerous for the fighters’ long term longevity and increase the seriousness of head trauma from these fights. As a result of the Lethwei rules and culture, toughness and aggression could sometimes be rewarded over technique because the ability to absorb punishment and to keep going even after being knocked out is a vital trait for successful Lethwei fighters. The content above is an example of an injury time out and revival of a knocked out fighter that would have not made it passed the 8-count rule. With Lethwei’s popularity increasing, individuals in Myanmar has devoted themselves to the sport in hopes of escaping poverty and making a name for themselves. As Lethwei becomes more marketable, it has attracted the attention of foreigners to come train and even compete in local and national events. Furthermore, Lethwei matches also feature female fighters from Myanmar striking with foreign competitors. Even the largest MMA organization in Asia, One FC, has held a Lethwei match at an event they hosted in Myanmar, which is represented in the image on the right. The ceiling to the combat sport of Lethwei is unknown, but its future is become increasingly brighter day by day as Lethwei matches are slowly beginning to be put on bigger international stages. If you are more interested in what a Burmese Lethwei gym looks like, take a look at this article from Vice. Should I Take Kickboxing or Muay Thai?